and have them contact Laurie Police Department. LAURIE, MISSOURI is embraced by beautiful country, rich with history and community and treasured for its summertime recreation. It was here that the Osage tribe of Native Americans once made their home, and today's amateur archaeologist discovers that the Osage River and Gravois Creek can still surprise by giving up arrowheads and tomahawks. It was also here that during the Great Depression, Bagnell Dam was completed to generate electricity, creating the Lake of the Ozarks amidst gently rolling hills lush with trees and greenery that would later give way to a resort community. The city also serves as a hub of west side activity for many rural residents who reside out­side the city limits with numer­ous restaurants, banks, conve­nience stores, retail outlets and churches. Altogether, there are nearly 200 businesses and five planned subdivisions in the city. Recreational activities in­clude two city parks total­ing more than 50 acres with a lighted ball field, soccer fields, pavilions, walking trail, playground, a five-screen cinema, 18-hole golf course, bowling alley and an indoor swimming pool. We are so glad you stopped by to visit our Web Site! 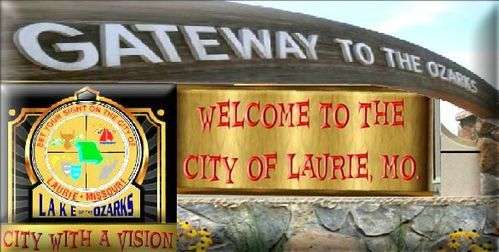 If you have any questions about LAURIE, MISSOURI, please email us or call 573-374-4871. The city is proud to provide city water and a state-of-the-art central sewer system as well as recently paved city maintained streets. With these substantial recent infrastruc­ture improvements, the city is poised and ready to welcome new residents and businesses alike.